Sales unexpectedly ended mid-December for the 2012 Presidential $1 Coin Proof Set. Its sellout was more of a surprise given that sales continue for last year’s 2011 Presidential $1 Coin Proof Set — and will until 12:00 noon ET on December 31, 2012 — and it launched in February 22, 2011. Conversely, this year’s set debuted on April 24, 2012, or more than 14 months later. While the U.S. Mint some two weeks ago moved this year’s set to the "No Longer Available" section of its website and stamped "Sold Out" beside its name, it continued to update its sales figures weekly until the latest U.S. Mint sales report was released this past Thursday. From that, it is apparent the mintage was capped at 250,000 since its final unaudited sales total is 249,298. Sales of last year’s set are more than 50,000 higher at 299,664. The 2012 Presidential $1 Coin Proof Set includes four proof dollars honoring the 21st through 24th Presidents of the United States. As such, obverses of the coins feature portraits of Chester Arthur, Grover Cleveland for his first term, Benjamin Harrison and Grover Cleveland again for his second term. As proof quality coins, they were produced at the United States Mint facility in San Francisco and bear the "S" mint mark. This year’s set sold for $18.95, which is $1 less than last year’s set. 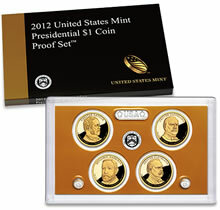 Based on the U.S. Mint’s preliminary product schedule for 2013, the Mint intends to begin accepting orders for the 2013 Presidential $1 Coin Proof Set on February 19, 2013. Its price will be the same as this year’s set at $18.95. The U.S. Mint revealed designs for the 2013 dollars earlier this month. Featured on them are William McKinley, Theodore Roosevelt, William Howard Taft and Woodrow Wilson.